Philipp Jungebluth, formerly right-hand man and student of the lethal trachea transplant surgeon Paolo Macchiarini, is threatening another lawsuit against me. This time, he is unhappy about being associated with the 5 trachea transplant operations Macchiarini performed in Italy (only one of these five might still be alive, with a permanent brain damage). Jungebluth freely admits through his lawyer to have been part in the two operations in Barcelona: the very first trachea transplant on Claudia Castillo in 2008, and another one, performed in secret against an explicit ban issued by the Hospital Clinic Barcelona, in a neighbouring hospital on the Argentinian patient DD. Both patients Castillo and DD were previously unsuccessfully operated on their airways by Macchiarini, both were eventually offered a bronchus or trachea transplant, respectively. I was informed how the 55-year old DD fared after the operation, and it was a total disaster (it is all but clear if she is still alive, in fact even survivor Claudia Castillo can’t be found anymore). These two operations were however according to Jungebluth part of his German medical education, the so-called “practical year”, as student of the Hannover Medical School (MHH). It seems that a past MHH professor, Heike Kielstein (nee Nave) was involved in the histological analyses of these trachea transplants. In 2010, Kielstein as part of award ceremony presented Jungebluth with a €2500 prize for his Macchiarini-supervised medical dissertation, which described only the first trachea transplant patient, but kept the second transplant operation on DD as a total secret. But MHH apparently knew about that highly unethical act, and did not mind at all. Hence, MHH did not cease all trachea transplant research in 2006, as they once told to me untruthfully. The technology was simply outsourced in a good MHH tradition to poorer parts of Europe. To escape tough German regulations or legal responsibilities? Or maybe because the non-German patients abroad were seen as more suitable for medical experiments? MHH, whose rector just recently ordered its own university not to investigate Jungebluth’s dissertation, remains deadly silent. Herr Professor Macchiarini, whose German is near-native (the Italian grew up in Switzerland) and is much better than his English, remains adjunct professor at MHH, against state law. Macchiarini came to Hannover in 1999, and worked as head surgeon in the communal hospital Heidehaus (read about disaster he caused there here). After having passed the surgeon exam at second attempt, he soon joined the MHH as a adjunct professor. There, the trachea expert was much needed for the university’s vision of regenerative medicine. At the turn of millennium, regenerative medicine studies with pig intestine-made organs were organised by MHH’s grand man, the heart surgeon Axel Haverich. The trachea-related work on pig guts was done under him by Heike Walles (back then Mertsching) with the help of her future husband Thorsten, who was training at MHH as thorax surgeon under Macchiarini. Animal experiments for tracheal grafts were according to all evidence non-existent, so Walles, Haverich and the corresponding author Macchiarini tested instead a small pig intestine patch on a German man suffering from cancer. Their common publications are not really convincing that the technology helped that patient in any way, analyses were made only during the first weeks because Macchiarini moved to Barcelona and the Walles couple to Stuttgart. The cancer-sufferer died less than one a half year later, noone will ever learn objectively how the patch really fared. In Stuttgart, Walles then transplanted two more patients with large tracheal grafts, again no objective information can be obtained here, since none of them is alive today. Also these transplants were performed on humans without any animal testing whatsoever, while being declaried as emergencies under compassionate use. To make sure no-one questions their work or associates it with its corresponding author Macchiarini, Walles sued me in court, where they indicated to consider the transplants as their (successful) research, and to have used their patients as research subjects to test their technology. MHH is currently investigating evidence of serious data manipulations in Walles papers from there. But if Jungebluth’s example is anything to go by, Walles have nothing at all to fear from MHH. Even now MHH remains absolutely loyal to Macchiarini, who can only call himself professor because the Hannover university chose to support his adjunct professorship there regardless of how patients he left dead or mutilated. This loyalty however goes against the state of Lower Saxony education laws (details here). The adjunct professor degree is namely coupled to continuous teaching, so MHH keeps Macchiarini listed in the curriculum, even if it is rather sure he never actually taught anything there since he left in 2004. If you struggle to understand how MHH can be the only research institution in the world which doesn’t mind to be officially associated with Macchiarini, maybe consider this fact: none of his known 17 trachea transplant patients was German or operated in Germany. In fact, even though Macchiarini left MHH in 2004, he continued to supervise medical doctorate students there ten years later, as his CV from 2014 verifies. Macchiarini was even supervising MHH doctorate students in 2014, when this CV was written. These were however MD dissertations, not at all comparable with PhD. Those were MD students, who as such wrote medical dissertations of rather small scientific value, not at all comparable to the extensive work which must go into a PhD thesis. Yet for Macchiarini, and his MD student Jungebluth, these degrees were perfectly equivalent to PhD, against the German law. In one case, two students were allowed by the MHH to share the authorship of an MD thesis, which goes against all rules and concept of a doctorate. This is how much MHH loves Macchiarini. Macchiarini’s MD students at MHH (or PhD, as he re-classified them). Nicke and Jasper shared the authorship of a single dissertation, because MHH didn’t mind. Jungebluth and Haag became Macchiarini’s loyal acolytes of trachea transplant research. “At the MHH until year [no year specified, -LS] a different concept was followed tracheal replacement based on patient’s own natural matrix (and not plastic-based, as later on applied by Prof Macchiarini in Barcelona and Stockholm). These concepts on bioartificial tracheal replacement were however not followed up from 2006 on at the MHH anymore”. The 2006 cessation claim was according to the MHH student Jungebluth not true, more on this below. Like Walles in court, Zorn pretended that Macchiarini never used bioartificial trachea grafts, only those made out of plastic. If you repeat a lie often enough, you and others may start believing it. And this lie of exclusive plastic use by Macchiarini is sorely needed, because others did apply a similar bioartificial method, or in fact intend to do so again even now. No-one wants it to be associated with the deaths around Macchiarini and his method. Fact however remains that Macchiarini’s two Barcelona patients (and 7 more elsewhere) received cadaveric tracheas, seeded with patient’s own cells for the purpose of regenerative magic. Many of these patients are dead, exact number of those still alive is unknown. Hence, what Zorn said on behalf of his MHH about plastic, is utter uninformed nonsense, or just a barefaced lie. The reason why Macchiarini was totally uninterested to continue with MHH’s bandage-like pig intestine patch he transplanted in Hannover: he developed a method to strip entire donor tracheas of all cells, which allowed him to replace large sections of the hollow organ (it never worked out of course, but certainly not due to the lack of trying). Walles were left with their precious decellurised pig intestine, which they tried to use for all possible organ Ersatz, including the above mentioned two graft transplants on human patients. Also Haverich lost all interest, he wanted to grow hearts anyway and became in this regard fascinated by 3D organ bioprinting (read here). Screenshot of Jungebluth’s talk from 2011. MHH’s Heike Kielstein (nee Nave) is listed as collaborator. “It is indeed correct that our client was present at both operations in Barcelona. This however not a s a responsible for operations, but solely as part of his training. Our client performed his practical year (PJ) in Barcelona at the University Hospital Clinic de Barcelona. He performed there- as every medical student in PJ- naturally also clinical tasks assigned to him. This always happened under the instruction, supervision and responsibility of his medical instructors in the local thoracic surgery, one of whom was prof. Dr. Paolo Macchiarini” […] The clinical tasks performed by him [Jungebluth,- LS] in the course of his PJ were completely legal”. “I do confirm Macchiarini did not perform a second airway transplantation in our Hospital. As I told you, our IRB [Internal Review Board, -LS] did not approve it”. That of course did not stop Macchiarini and his loyal student Jungebluth. They just went elsewhere: to the private hospital Institut Dexeus in Barcelona, where Macchiarini had an associated position at that time. From the hospital’s website it does not look as if they have a thoracic surgery department at all, and it is likely they are legally not qualified to perform any experimental surgeries. Argentinian patient abused in secret, to teach an MHH student? The patient DD was a pharmacist from Argentina, 55 years old at that time. She was initially twice operated on her airways by Macchiarini at Hospital Clinic Barcelona. The operations failed, so a few weeks after the second operation, in late 2009, Macchiarini decided to transplant his patient with a cadaveric trachea, after he convinced himself that her predecessor Claudia Castillo was such a success. The animal tests on pigs were performed according to all evidence AFTER the June 2008 transplant on that human patient, though Jungebluth presented it differently to MHH during his doctoral defence in 2010. Noone asked him in Hannover for evidence from Spain back then, his word sufficed. Even now, Jungebluth and his master insist that they tested the method on pigs first, but evaluated and published the data after the 2008 operation (as if it makes any sense!). In 2009, when pig experiments were finalised for publication, the second human research object was employed, the patient DD. Important: Castillo never received an actual trachea transplant, but only a part of her left bronchus was replaced with a cadaveric graft (her story here). Key difference: you have two bronchi, but only one trachea. When a bronchus transplant collapses or even fails completely, the patient can still be saved, with a removal of a lung as the worst option (which Castillo eventually suffered last year). If however a piece of a rotting cadaveric trachea is all you can breath through, then it does get really dangerous. And what DD received, was a cervical trachea replacement, the central middle section of the airways. No wonder University Hospital review board denied a permission, as problems with Claudia’s bronchus became apparent at that time already. According to my source, a cadaveric trachea graft was smuggled by Macchiarini from his main place of work without permission and brought to Dexeus in secret, where it was transplanted into the patient using the”bionic” method originally developed by his other MHH-long-term collaborator, Augustinus Bader (who is now at University of Leipzig). Main feature of the “bionic” method: it spares the tedious, permit-bound and time-consuming bioreactor work of trachea “regeneration”. You can do it in any operating theatre, quickly. All you need is: a patient, a decellurised cadaveric trachea in a bag, two vials with patient’s own bone marrow and airway epithelial cells each, and an aliquot of erythropoietin (EPO) and maybe other grown factors. You remove your patient’s airways, quickly put in a cadaveric replacement, sprinkle it with stem cell magic and EPO, close chest, suture, done. Then forget the patient and let other doctors save her life. The medicine student Jungebluth was part of it all (he insists through his lawyer that he only liked to watch though), and apparently so was, though indirectly, his Hannover university. The freshly installed trachea graft of patient DD detached very soon after, a leak at the suture site appeared and an infection ensued. The transplant failed spectacularly, the patient DD almost died. In time she received a tracheostomy to save her life, apparently at the Hospital Clinic Barcelona. I asked Castells to confirm these events, twice, he did not reply. Neither did Kielstein (nee Nave), the MHH collaborator who might have analysed that patient’s samples. Indeed, what happened to DD is nothing to be proud of. Yet for MHH leadership, the suffering of these two patients was never an issue to lose sleep over. DD, just like Castillo, was from Latin America. But the German student from a fine wealthy local family, Philipp Jungebluth, was given a prize of €2500 by the MHH, for his dissertation on trachea transplant work in Barcelona. The person who gave Jungebluth the award was the same who probably analysed biopsies from the Barcelona patients: the MHH professor Kielstein. Macchiarini afterwards went on presenting DD as full success in a talk to Royal Society of Medicine in 2010, he and Jungebluth then did same in their common manuscript from 2014. Of course they knew how the graft detached and failed, while almost killing the patient. But in their narrative, it worked perfectly. In 2014, DD was to be presented to the scientific community as alive and well, though it is rather sure Macchiarini since long lost all track of her, as it happened to many of his other patients. DD and Castillo are also Hannover university’s responsibility, who basically condoned these patients abuse so MHH’s cherished wunderkind Jungebluth gets his prize-winning medical doctorate. Dishonesty is so common with Macchiarini and Jungebluth that one does wonder if they ever said or wrote anything true. The MHH keeps the former as their professor and granted the latter an MD degree, under conditions which are worth their own investigation. Only that there never will be one, unless the state government of Lower Saxony feels pressured to eventually start caring for basic ethics. 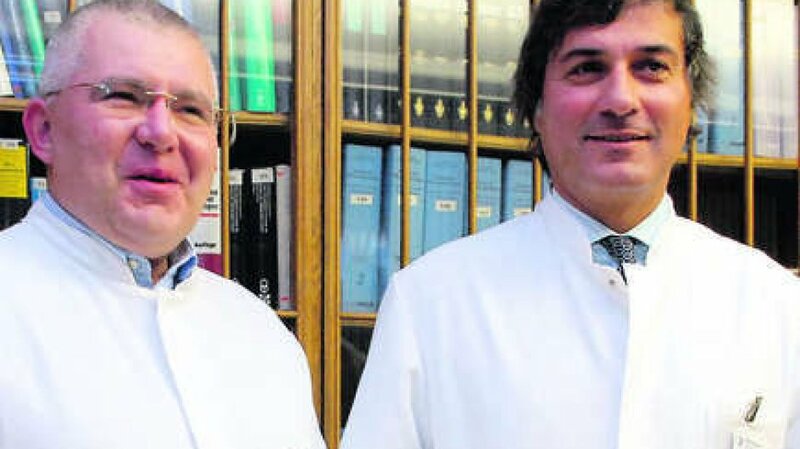 Macchiarini in Lower Saxony, next to Wolfgang Harringer, former head surgeon at MHH, at the time of the photo-op (2008) head of Thoracic and Cardiovascular Surgery, Klinikum Braunschweig (near Hannover). Harringer and his communal clinic were employing Jungebluth as surgeon trainee 2009-2014, while the young trachea transplanter was actually working in parallel at the side of his master in Italy and Sweden. Jungebluth declares through his lawyer he was doing his practical year as MHH student in Barcelona (his own two CVs either speak of a research, but not clinical, fellowship, or assign him back to Hannover just when the two patients were transplanted; while the Hospital Clinic listed his as a mere technician, see here). Maybe MHH recognised that Barcelona stint retrospectively as a practical year, because to them Jungebluth is that special. They didn’t mind him spending practically all his time from 2001 on with Macchiarini at the Heidehaus hospital in Hannover (allegedly as a fully-trained intern, as soon as he started his MHH studies! ), and from 2005 or 2006 on (depends on CV version) with his master in Spain, instead of attending lectures and courses at MHH in Germany, like this university’s less talented and precious students had to do in order to graduate. Excerpts from two Jungebluth’s CVs. Did he ever attend a single course at MHH, one wonders? Yet he graduated, even with a award for the best doctorate. after the extensive investigation, the Ombuds process (OBF 76a) which you yourself initiated on 21.12.2016 regarding your cumulative dissertation, was officially terminated after an initial analysis by the president of MHH, Prof Dr. C. Baum. It does sound like the MHH president ordered his allegedly independent university ombudspeople to stop the investigation. Cumulative dissertation means that it consists of Jungebluth’s combined publications and little other text. What happens however if his papers should get retracted? That would tear apart the cumulative dissertation, but we can sure expect president Baum then decreeing that everything is fine. MHH president Baum declared Jungebluth’s research on Castillo and DD as perfectly good and ethical science. MHH apparently believes that the Macchiarini scandal will soon subside and the greatness will be restored. In fact, they had another scandal with outsourcing human research which played out rather well for them. In 2002, Haverich decided to test his allegedly growing heart valves (made from decellurised scaffold and regenerated with patients’ own cells) on humans (as usual, there is no evidence for previous animal testing). Officially, two children in the desperately poor ex-Soviet republic Moldova received such, other sources speak of at least 3 children (read here). Though there is not really much actual scientific evidence in Haverich’s own papers for the dead connective tissue ever growing or being brought to life, Haverich eventually succeeded to widen the “growing” heart valve tests in Moldova and Germany. 9 years after the first Moldova tests he eventually pulled in 2011 €6.6 million EU funding for a huge clinical trial with those valves. Macchiarini’s experiments on two Latin American women in Barcelona are by now 8-9 years in the past. What if MHH simply waits for dust to settle and the big clinical trial funding for trachea transplants to come to them anytime, hence their insistence to keep Macchiarini their adjunct professor? MHH sure needs money. The university lost €100 million between 2011 and 2015, due to mismanagement, condoned by the state government. Professors were recruited and tenured, where there was no money to do so (apparently the calls were not really that open, like this one). At the same time, suspiciously many questionable clinicians and scientists came originally from the MHH. There are of course Heike and Thorsten Walles, and Macchiarini’s long-term associate Augustinus Bader, the inventor of a miracle wound-healing cream and the bionic method of organ regeneration (read my article here). Then there is the misconduct-tainted stem cell researcher Karl Lenhard Rudolph (read my article here). Finally, the paediatrician Christoph Klein, who according to the newspaper SZ “treated ten children who suffered from the life-threatening Wiskott-Aldrich syndrome with a course of gene therapy. Eight of the 10 children subsequently developed leukemia, and three of them have since died.” (SZ article here, in English) Klein then sued SZ in court and had text passages removed criticising his gene therapy methods. There were other awful MHH scandals, just search the German internet. Good thing for MHH and their darling Jungebluth that German courts tend to take the doctor’s side by default and the German media therefore carefully avoids all negative Macchiarini reporting. A search with German keywords “Macchiarini Luftröhre” (trachea) brings barely anything recent or overtly critical from the German media. MHH’s role is never mentioned, except in the old articles, which celebrated the pig-intestine patch operation he performed with Walles in 2003. But you can still read all about Macchiarini’s miracle cures of Claudia Castillo, Andemariam Beyene, Yulia Tuulik or Hannah Warren (later three all dead). Hardly any of the main German media like Der Spiegel who were touting that farce ever brought a single Macchiarini-critical article afterwards. Regarding their professor Macchiarini and his trachea transplants, MHH managed to both have their cake and eat it. So far. Dear readers, if you would like to support my ongoing court defence against Jungebluth’s injunctions financially, donation amount doesn’t matter, please go to my Patreon site or contact me.